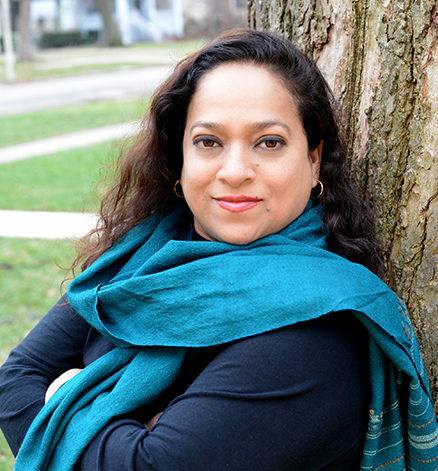 Born in Hyderabad, India and raised in Chicago, Samina Hadi-Tabassum is an associate clinical professor at the Erikson Institute in Chicago. In her poem, “A Ghazal for Hadiya,” Hadi-Tabassum honors the memory of children lost to gun violence. A beautiful young 15-year old girl with a great life ahead. Made the national news for being murdered instead. Taking shelter from the winter rain in a South Side park. Six shots fired in broad daylight and not in the dark. A city that lost its honor. Huddled one day with friends after a day of exams. Caught in gang warfare and becoming the sacrificial lambs. Honor students at King College Prep. Young men with guns hunting in the streets…watching their friends fall. Innocent victims running out of breath…trying to make that 911 call. Wearing orange to honor the hunted. Just yesterday she was singing at the White House for the President. Now the First Lady comes to speak at her would be commencement. Honoring her with a purple stole. On the Saturday of her funeral at the Greater Harvest Baptist Church. We grasped for meaning in words and sought solace in this search. The hallways and the classrooms are now plagued by a silence that stays. Sadness and depression take over and a feeling of emptiness pervades. Waiting for the Chicago gray and blue of winter to retreat. Hoping that spring light will help us stand back on our feet. Hold Nature in great honor said Zora Neale Hurston. Yet it is the hot summer months that will haunt us the most. When more stray bullets turn our loved ones into ghosts. We honor you too Vonzell Banks. Hundreds gather, holding hands and praying that the violence will soon stop. Holding vigils, lighting candles, beating drums, even staging a balloon drop. We honor their grieving mothers and fathers. And you, Hadiya Pendelton, a daughter to us all. We will honor you. We will sing your song. Take Me to Your King. If you are a written or visual artist looking for a platform to publish your work, send your submission to info@thetriibe.com.